It is very hard to believe that it is now more than three years since David Bowie left us. Such was the extraordinary influence that he had upon popular culture in general and contemporary music in particular his memory will live on forever. His legacy does not require any additional help whatsoever, but the band Holy Holy have nonetheless determined to be the keepers of Bowie’s flame from the years 1969-73. And if anyone has the right to assume this role, they do. 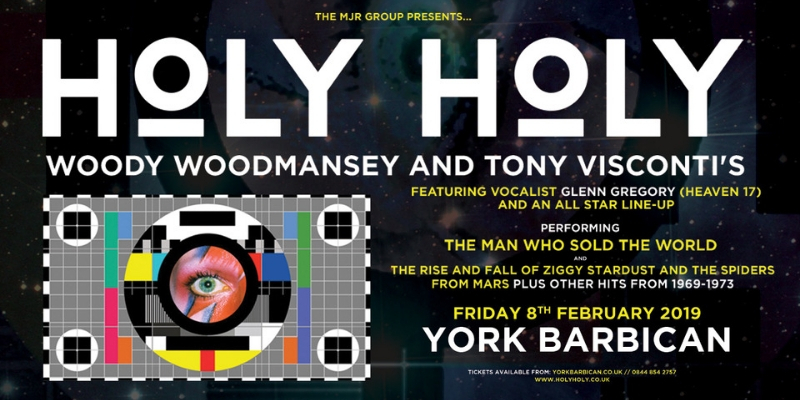 Approved by David Bowie during his lifetime – he used his website to advertise their gigs – Holy Holy feature not only the last surviving Spider from Mars, Woody Woodmansey but also Bowie’s great friend, collaborator and the man who produced no less than 13 of his studio albums, Tony Visconti. In addition to Woodmansey and Visconti (who play their respective drums and bass guitar), Holy Holy can also boast Glenn Gregory (vocalist with 80’s synth-pop outfit Heaven 17), James Stevenson and Paul Cuddeford on guitars, Berenice Scott on keyboards, and Visconti’s daughter Jessica Lee Morgan on vocals, guitar and saxophone, in their hugely impressive ranks. Here in York on what is the opening night of Holy Holy’s current UK tour, the seven musicians take to the stage to the resounding fanfare of Beethoven’s ‘Ode to Joy’ as was featured in Stanley Kubrick’s futuristic art-house classic, A Clockwork Orange. Its last strains mutate into the opening bars of ‘The Width of a Circle’, the first track on what was David Bowie’s third studio album, The Man Who Sold The World. Holy Holy proceed to play The Man Who Sold The World – produced by Tony Visconti, with Woody Woodmansey on drums, and originally released in the United States in November 1970 – in its entirety and in the exact order of the original track listing. Still replete with all of its proto-metal riffs and with Glenn Gregory replicating Bowie’s high kicks as pictured on the record’s sleeve, the songs often sound rather quaintly dated and reflect an artist (Bowie) just starting to properly find his creative feet. With barely a pause for breath, however, Woody Woodmansey’s despairing drum beat on ‘Five Years’ introduces the opening song on Bowie’s fifth studio album The Rise and Fall of Ziggy Stardust and the Spiders from Mars. It is difficult to fully fathom that Ziggy Stardust was released just 20 months after The Man Who Sold The World such is the creative distance that Bowie had travelled during that period. In that short time he had already stretched the boundaries of art, conceptualisation and sexual attitudes and this is mirrored in the record’s music that almost 50 years down the line still sounds as if it has come from another planet. And Holy Holy do Ziggy Stardust immensely proud, not just replicating the album’s 11 songs but investing them with added impetus and muscle. “Keep your ‘lectric eye on me babe” Gregory wails on ‘Moonage Daydream’ as Bowie (as pictured on the cover of Aladdin Sane) stares resolutely from the front of Woodmansey’s bass drum. You strongly suspect that the great man would surely have approved. Holy Holy step tentatively out of their late 60s/early 70s time capsule with their first encore, ‘Where Are You Now?’ Taken from David Bowie’s 24th studio album, the 2013 release The Next Day, the song found Bowie reflecting upon his time in Berlin in the mid-70s. Here, it is genuinely moving – Glenn Gregory appears completely overwhelmed by it all – and affords us the opportunity to reminisce even more about David Bowie, the man and his music as Holy Holy link the past with the future.